HMH Books for Young Readers, 9780544798755, 40pp. 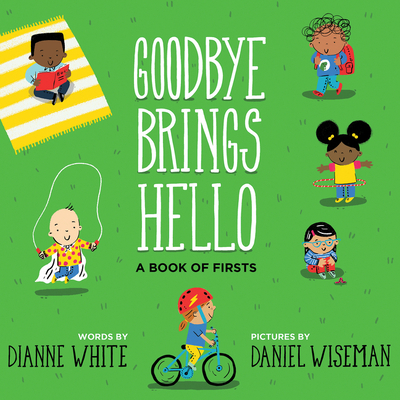 Dianne is the author of BLUE ON BLUE, illustrated by Caldecott Medalist Beth Krommes which received four starred reviews and was also named a Boston Globe Best Picture Book of 2014 and an Amazon Best Books of the Year 2014 (ages 3-5), among others. Dianne makes her home in Arizona and holds an elementary bilingual teaching credential and a Master's in Language and Literacy. In 2007, she received her MFA in Writing for Children and Young Adults from Vermont College of Fine Arts. For more on Dianne, please visit diannewrites.com and on Twitter @diannewrites. Daniel Wiseman remembers saying goodbye to the training wheels on his bike, and saying a great big hello to skinned knees and elbows. But the freedom of rolling on two wheels was well worth the bumps and bruises. He still rides his (slightly larger) bike almost every day. Daniel loves to draw, and has illustrated several books for children. He lives in St. Louis, Missouri where he enjoys his life of making pictures, riding bikes, and spending time with the best family anyone could ask for! Visit him at danieldraws.com and on Instagram @d_wiseman.